I’ve been carrying around a slip of paper in my wallet for months now. 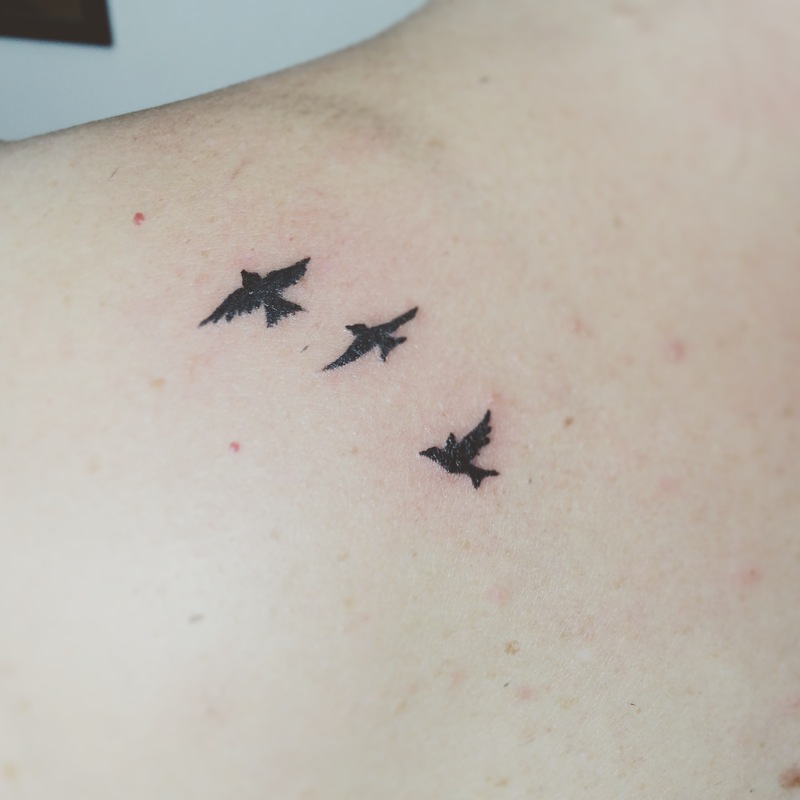 It is a silhouette of three little birds in various stages of flight. These represent my three children: my son in another country, living his life as a musician; my daughter the next province over, poised to start university next week; and my youngest son, who is on the brink of adolescence. My hesitation to get a tattoo was a strange mixture of fear of pain coupled with the embarrassment of being an almost-50 year old mom wandering into a hip Vancouver tattoo shop. Tired of excuses, I went in on Tuesday and finally just got it done. I was sitting at the end of a yoga class at work yesterday. The instructor told a story of her 19 year old daughter at the dinner table. Tears fell out of my eyes. I have a 19 year old daughter, but she’s no longer regularly at my dinner table. I felt sad for myself, but then I remembered my birds on my shoulder. I breathed gently, and joined in the Namaste at the end of our session. I bowed to the spirit of my daughter, the spirit of my wayward eldest son, and the spirit of my youngest son with an extra chromosome. May those little birds perched on my shoulder remind me that it is ok to let them go. It is only then they are free.